Ember has powerful conventions around nested routes. One of those conventions is to render the template of a child route into the outlet of it’s parent. If you’re not yet familiar with outlets in Ember templates, they are similar to yield in Rails views. This convention allows you to trivially create complicated nested layouts, that would require the use of content_for with a lot of manual management in Rails. Because the album route is a child of the albums route, which itself is a child of the artist route, all of these templates are rendered when viewing an album. Since Ember automatically adds an active class to links when their corresponding route is active, our “Albums” tab will have the correct styling when viewing any route under it. Move routes up a level if the UI isn’t nested. Let’s say we don’t want to show the artist name and tab UI from above when viewing an album. To make that happen, move the album route to the top level in the Router. 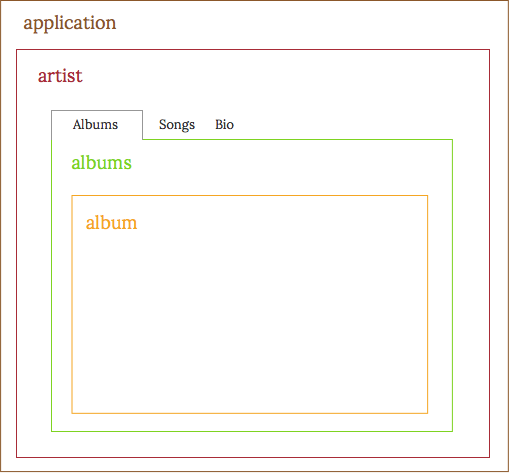 By doing this, Ember will render the album template into the default outlet in the application template, replacing the artist name and tab UI that is defined in the artist template. If you still want to keep the URL nested, add another dynamic segment for artist_id to the album route’s path option. Ember URLs and API URLs don’t need to match. When deciding to nest routes, think of the Router as describing your interface rather than a URL structure. Keep in mind that routes in Ember are completely independent from the URLs of API resources. Even if your API URLs are nested, it does not necessarily mean that your Ember routes should be.